Imagine being able to explore simple movement in a way that has you performing secret agent tricks. The exhilarating feeling of defying gravity as a form of getting an intense full body workout. Sounds awesome right?! 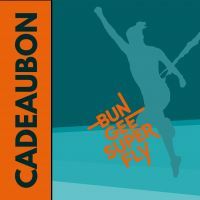 That's Bungee Super Fly! Breathe in a new form of freedom. Try innovative ways of getting fully into shape, working between the ground and the air. Full body workouts or express yourself through dance. Experience what a Bungee workout does to your body and mind! You can explore in our 1,5 hour weekly workshops. 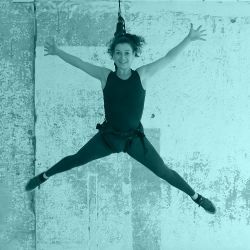 Do you enjoy the Bungee workout and want to deepen your knowledge, learn new movements & techniques, or offer it yourself to students as a Bungee Super Fly instructor? 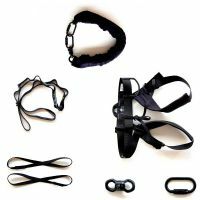 Including Bungee Super Fly cord, harness & rigging. A dynamic multi-tasker, who makes her living jumping and flying about. She connects easily, and brings out the best in people with her sparkly personality. She has pioneered and led the Aerial Yoga business in The Netherlands & Belgium for 7 years now. After graduating from the Institute of Performing Arts in Amsterdam, Sjoerd worked as a dancer, singer or actor in several musical productions. One of them was Tarzan, a show filled with aerial acrobatics, which was his introduction to working with a bungee.